From its copious opening aerial shots of Chicago, it’s clear Duncan Jones is letting us know from the outset that his sophomore feature isn’t going to be the low-key affair he so expertly crafted in his debut Moon and that we’re in for something much grander in scale. Source Code’s concept is a good one; Jake Gyllenhaal plays Captain Colter Stevens, a solider on a top secret mission that allows him to relive (time and again) the last eight minutes of a passenger’s life on a doomed commuter train in order to find out who done it. Vera Farmiga is Colleen Goodwin, his cagey but sympathising handler, while Michelle Monaghan takes up the Groundhog Day love interest role as Christina Warren, although unlike Andie MacDowell’s Rita, it’s pretty clear from the off that she digs him so they’re bound to get together whatever he does. 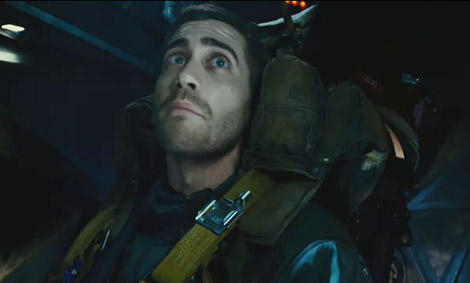 Gyllenhaal does a good job of progressing from confused temporal traveller, bouncing from unfamiliar body and location to information starved mission pod/prison, to rushed investigator grokking his surroundings to solve the mission and throw in some mischievous divinations from his orders in an attempt to save the day for all his fellow exploded passengers. Over at control, Jeffrey Wright’s back room, not quite moustache twirling Dr. Rutledge plays well against Farmiga, who struggles to maintain the professional level of detachment and misinformation require to get the job done. Which makes it all the more frustrating that Jones doesn’t seem to fully flex his muscles and give us more than a clever concept with lackluster follow through. The ‘who done it’ portion of Source Code is pretty easy to guess within the first few run throughs, which leaves us with only Captain Stevens’ predicament to ponder…for all of about five minutes. Knowing where you’re heading in a film doesn’t necessarily spell the end of enjoyment, but if that’s the case then the journey and the final destination best be worth it. Just as Colter longs for the right to only have to die for his country once, I wish that Jones had extended the same courtesy to the audience. At one point we’re given a Buffalo 66-esque freeze and track through the train carriage which captured both a moment of beauty and the eternal tragedy of Colter’s situation. It wouldn’t have been enough to elevate Source Code to the heights of Moon, but would have at least left us pondering the existential question of the value of a moment’s happiness. However, it turns out this was a mere glimpse of a conclusion that could have been but wasn’t deemed good enough by the powers that be (I sincerely hope Jones fought the good fight but was unfortunately overruled) and we’re thrust back in for a cringe inducing, happily ever after sequence, followed by a bit of temporal, world logic rule breaking worthy of Ronald D Moore. It’s a shame because at its heart Source Code has an interesting concept and we all know Jones can certainly direct given the right budget, material and space. Hopefully next time he’ll get less of the first and more of everything else.